There is quite a bit of nostalgia in these photos. Many of you remember my 7am Sunday morning bicycle rides across the Pearman. 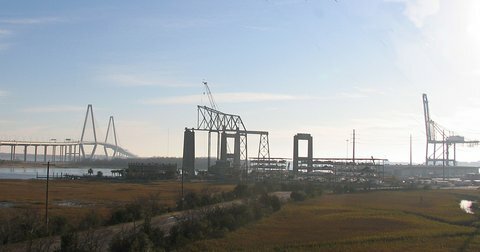 This was the first strategy I used to obtain some close-up photos of building the deck and pulling the stay cables of the Ravenel Bridge. My bicycle path, shared with the other early Sunday morning traffic is no more. That the bridge is disappearing is a great relief to my wife, Ellen, who looked on my Sunday morning bicycle adventures as a source of great anxiety. I managed to survive my bicycle adventures - thanks in part to the Mt. Pleasant police that, from time to time, ran interference for me. 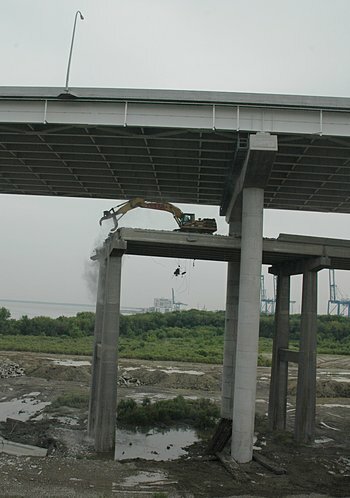 Later, SCDOT, PBC and Freyssinet played a major role in reducing Ellen's anxiety by providing additional options for some of the detailed photo essays. 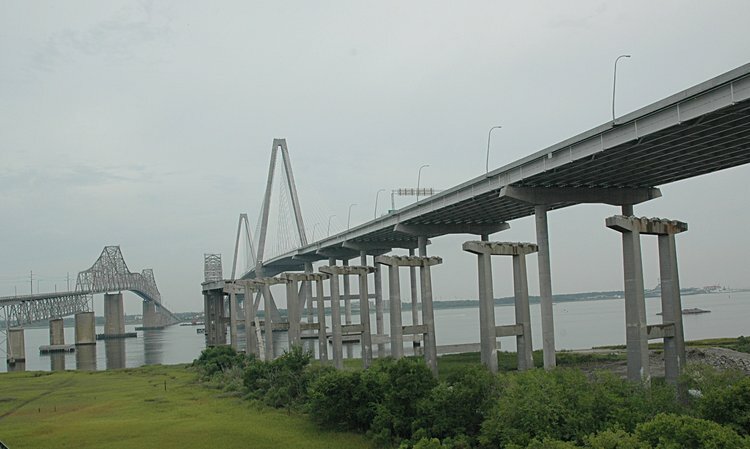 Today, while walking the Grace Bridge, I can clearly see in my mind's eye, each place I stopped and took photos of the growth of the Charleston and Mt Pleasant approaches as well as the twin towers and building the main and back spans. Now for the current story: The Grace (left) Ravenel and Pearman approach (right). 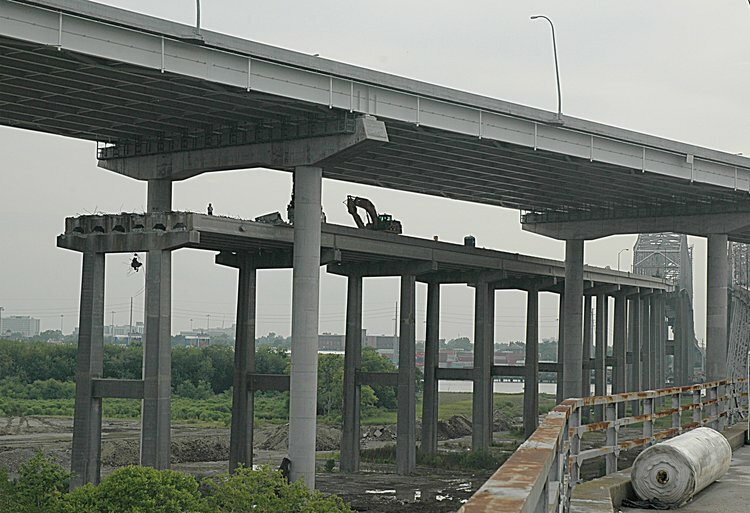 Much of the recent demolition has focused on removing the approaches up to the steel superstructure. 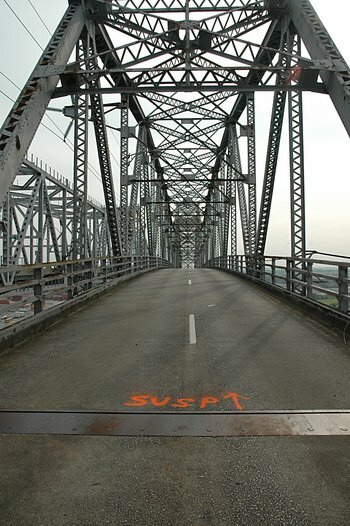 Here you can see the pairs of piers with their caps, but gone is the roadway and edge barriers. Looking west at the end of the Pearman approach from US 17, note the clean shave the Cashman-Testa folks give each segment. And of course, in the background is one of the Stanley-LaBounty mobile shears (what I refer to as bridge eaters).